How can Austin reduce the number of deaths on its roads? Speed. Improper movements. Failure to Yield. Distraction. Impaired driving. These are some of top contributors to traffic fatalities in Austin. 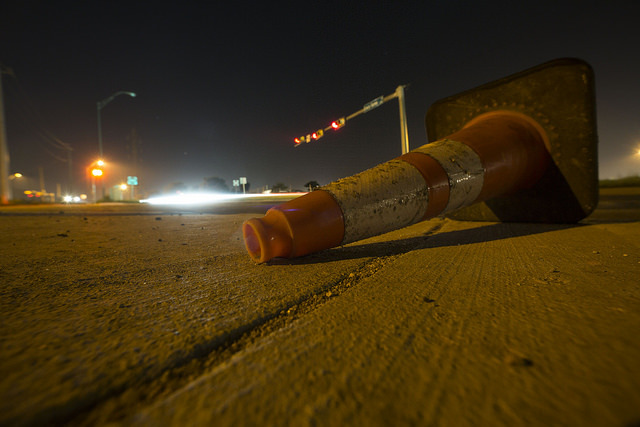 Last year, more people died on Austin’s roads than ever. No one has a clear answer as to why there was such a sharp uptick, but the city is working on finding ways to address the deadliest contributing factors. In the middle of 2015, the Austin Police Department ramped up its DWI enforcement, and for the first time began patrolling the streets seven nights a week. And DWI arrests dropped from 6,195 in 2014 to 5,844 in 2015. Still, impairment was a factor in 61 percent of last year’s fatal crashes. And, of all the drivers who died in traffic crashes last year, 75 percent of them were impaired. Officer Ronald Giachetti has been working DWI patrol in Austin for about a year. In many Austin neighborhoods, walking safely is a challenge. Many streets don’t have sidewalks. Along busy roads, crosswalks can be difficult to find, forcing many to cross mid-block. At night, the issue is worse. Many areas have poor lighting. In 2015, 30 pedestrians were killed by cars on Austin’s roads. Most of the crashes occurred when it was dark out, a trend that’s continued into 2016. Weeks ago, as Adrienne White dealt with the fallout of one of those crashes, the unthinkable happened. Police, advocates and city officials say those experiencing homelessness in Austin run a disproportionately high risk of being hit by cars. Robert Lormond (pictured left) is homeless and asks for money near roads in South Austin. He says that while he and others seeking shelter could try the Austin Resource Center for the Homeless downtown, it’s never a guarantee that you’ll find an open place to sleep there. And, he says, for the homeless people who live towards the city’s periphery don’t have access to as many transportation or shelter resources as those near the city center. Waco (who wouldn’t tell KUT his real name) agrees with Lormond that it’s dangerous living near the city’s roadways. He’s been hit by two cars in Austin. One of those times, he says he was in the wrong. But he says the second time, he was clear to cross the street, and a car hit him near I-35 at Woodward. “I don’t think any citizen or anyone would think hanging out by high-speed intersections is safe behavior,” says Art Fortune, APD Highway Enforcement Commander and Vision Zero Task Force member. And, Fortune says, hanging around those intersections after sundown only compounds the risks already faced by homeless Austinites. Billy Fields, a professor at Texas State University and a member of the Vision Zero Task Force, says there’s a simple solution: Lower the speed limits. If a car driving 40 mph or faster hits someone, there is at least a 70 percent chance that person will die. Reduce that speed to 30 mph, and a person hit would have around a 50 percent chance of dying. Reduce the speed to 20 mph, and the risk of death drops to around 10 percent. However, speed limits in Texas are governed by what’s called the “85th Percentile Theory” (pictured left). The Texas Department of Transportation measures the speed at which 85 percent of drivers navigate a roadway, and that’s often the guiding principle for setting the road’s speed limit. “That is really problematic because most of our streets are above 30 miles an hour,” Fields says. Go here to read more about what it takes to change a city speed limit in Texas, and how a change could impact the number of fatal accidents. Distraction was the number one contributing factor in all traffic crashes in Austin between 2010 and 2014, though police say it’s often difficult to prove definitively whether a distraction led to a fatality. Austin’s ordinance banning use of handheld electronics while driving took effect in 2015. Police have issued over 7,000 tickets since then. But the problem doesn’t seem to be getting any better. There is little in Austin’s Vision Zero plan aimed specifically at distraction. Mike Myers’ daughter, Elana, graduated from Bowie High School in 2013. During her first year at Texas Tech, just shy of her 19th birthday, she headed home to Austin from Lubbock on April 9, 2014. She never made it. She died when she drove off the road, crashed into an embankment and rolled her vehicle. She also wasn’t wearing a seatbelt. Police said the crash appeared to be caused by distraction. “Elana was very smart. But we also know that that phone was always by her,” Myers says. The final draft of the city’s Vision Zero plan lists dozens of recommendations to improve traffic safety through three main avenues: engineering, enforcement, and education. One-third of the report focuses on engineering solutions, like improving the way roads are designed and slowing the speed at which traffic moves. For improved enforcement, the Austin Police Department wants to get more traffic and DWI officers out on patrol. The city also recommends a Vision Zero education campaign that will raise awareness and get people to change their own behaviors. A study published in 2009 by researchers at Cornell University concluded that when Washington D.C. lengthened its metro hours from midnight to 3 a.m., DWI arrests and alcohol-related fatal crashes dropped by as much as 40 percent. But the city’s Vision Zero plan includes no recommendations to expand transit options. Currently Cap Metro provides Night Owl and E-bus services that run until 3 a.m., but there are fewer routes and ridership is low. Instead, the city’s recommendations include increasing DWI enforcement. The Austin Police Department says it plans to ask the city for funds to add roughly nine officers to its DWI team. In a yet-to-be-published report where eight researchers (including Dr. Jane Maxwell with the University of Texas) considered what most effectively reduces DWIs, enforcement tops the list. But many of the enforcement tactics praised by these researchers are out of the hands of Austin policymakers. For example, these researchers consider sobriety checkpoints to be one of the most effective means of reducing DWIs. But in Texas, checkpoints are illegal. So the city’s proposed a diverse list of recommendations: encourage more bars to serve food, consider limiting the number of neighborhoods with a high density of bars and explore implementing a city liquor tax. But many of these are phrased loosely – using the words “encourage,” and “consider.” Plus, that last one is impossible – the state oversees liquor tax. City staff says this one will be removed from the plan. The city council still needs to approve the plan. If it does, the next step is finding funding for these projects. The Austin Transportation Department will lead the way, along with a collection of other city employees. But it could be an uphill battle to get that funding and buy-in to complete these projects. Recently, Austin’s Bond Oversight Committee voted down a request to put a bond on the November ballot that would fully fund bike and sidewalk infrastructure, which will make it more difficult to improve walking and biking around the city. Many of the other recommendations could take years to implement. For a closer look at Austin’s traffic fatalities and the city’s plan to make its streets safer, you can find more of our coverage here.